Susquehanna County employees found a soft spot in the roof of the courthouse in Montrose (above) while inspecting the clock tower recently. Repairs to the both the roof and the tower could reach $90,000. 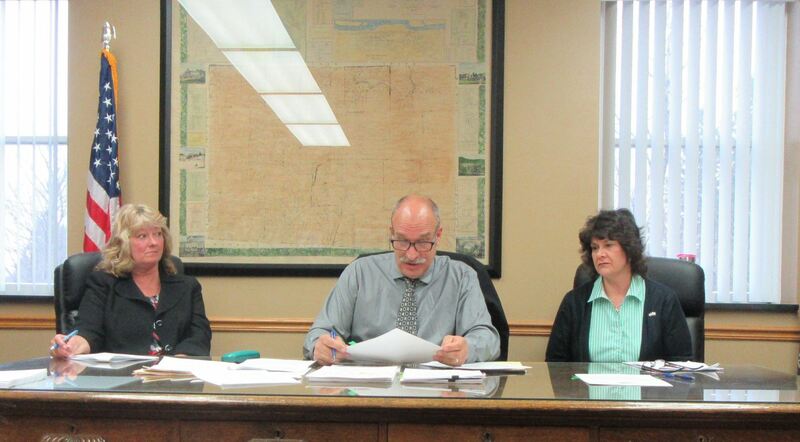 The announcement by Commissioner Alan Hall (top, center) came after the regular meeting of the commissioners was adjourned. 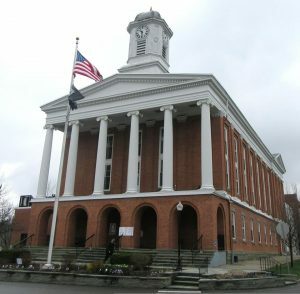 With just a few months to go before the completion of a multi-million dollar renovation of the Susquehanna County Courthouse that will effectively tie together what was originally three buildings, Commissioner Alan Hall told reporters after this morning’s meeting that a portion of the courthouse roof will have to be replaced. “We were up there looking at the clock tower and found a weak spot,” Hall explained. He and other employees then went into the crawl space under the roof and could see that several charred timbers were giving way. The charred timbers are remnants of a fire started by a painter at the courthouse in the 1930s who was using a blowtorch to soften old paint on the pillars. “They just covered it up,” said Hall. According to Hall, that was at least the second historic fire at the courthouse, the first happening sometime around the 1880s when lightening struck the clock tower. The clock tower itself is in need of repair, which is what prompted the recent inspection. The proximity of the weak spot to the clock tower worries Hall. “I’m afraid if we wait, that (clock tower) will fall into the building,” he suggested. The rubber roof will need to be pealed back to allow for an expected $20,000 repair, after which work on the clock tower will begin. That could cost between $50,000 and $70,000. Hall added that he doesn’t even want to think right now about the half million dollars that will eventually be needed to replace the entire roof. 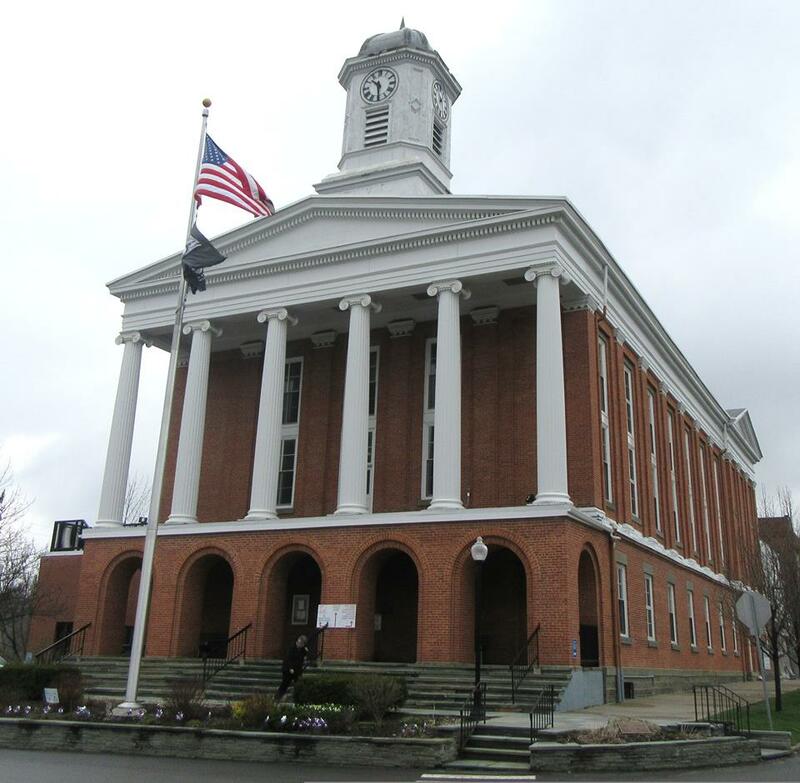 Among numerous staff changes recorded at the county level were resignations, transfers, new hires, and positions left open at the Susquehanna County Prison. Corrections officers leaving the prison include Pamela Larrabee and Grant Shelp. Hired on a part time basis were Penny Alden, Brad Allen, and Brandon Swift. Tami Tewskbury was promoted from part time to full time. When asked by an audience member how the $13.95 per hour starting pay compared to other counties, Hall replied that Susquehanna County was right in the middle among other 6th class counties. When asked by the same person if a higher rate of pay might increase retention, Hall said that he doubted that it would make a difference, as most of the corrections officers leave to work at the state penitentiary in Waymart, Wayne County, where they can make much more money. The commissioners voted unanimously to enact a county-wide burn ban requested by area fire chiefs. The ban will take place on Saturday, April 22 and last through Monday, May 21, pending conditions. Hall noted that the ban is due to increased vegetation at ground level and a change in the weather between winter and spring.